There’s something about country towns that puts a spell on you. They wind you down a few notches and put you in a different frame of mind. They run at a different speed to the city – a better speed in my opinion. It’s a speed that’s closer to that which human beings run at. 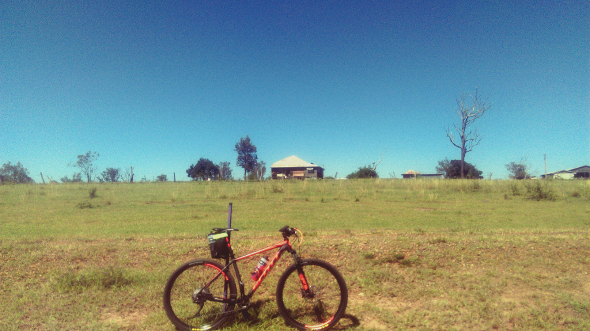 Fernvale in South East Queensland is no exception. But Fernvale also has something extra special to offer bicycle obsessives like me. 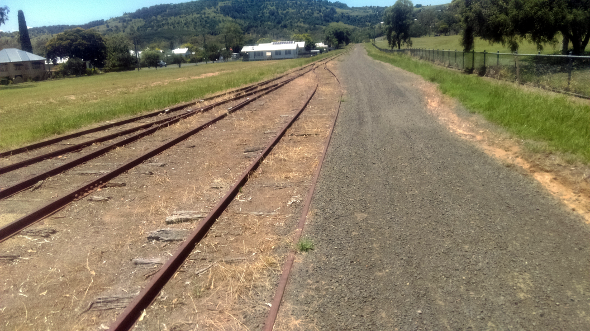 It’s located upon one of the jewels of country South East Queensland – the Brisbane Valley Rail Trail. 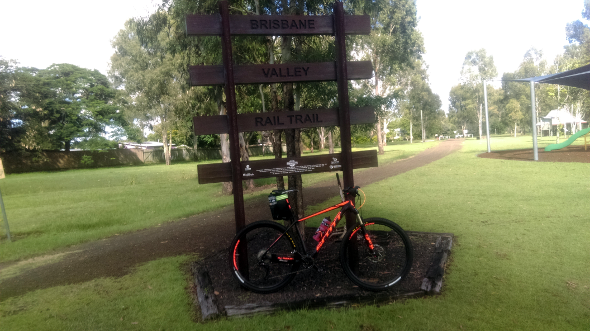 The BVRT meanders for about 160km from Wulkuraka to Yarraman along the path of the old Brisbane Valley Railway Line though today, I’ll be riding a short section from Fernvale to Coominya and back covering about 50km. It’s a summer morning as I saddle up at Fernvale and the mercury is already in the mid twenties so I’ve packed plenty of water, electrolytes and applied and extra thick layer of sunscreen. The chosen bike for the journey is my 2016 Scott Scale 940 hardtail. With my extra large Top Peak saddle bag, I had enough room to pack all of the day’s necessities though being the pedantic old fusspot that I am, I probably packed more than I needed and I could probably have gotten away with a large hydration pack instead. But at least it shows that even for a longer multi-day journey with overnight stops at some of the many accommodation venues along the BVRT, an ordinary mountain bike like the Scale 940 is quite ample. If I took out some of the crap I didn’t really need and swapped the tiny hydration pack I brought for a slightly larger one, there’d be plenty of room for some extra clothes and other necessities for an overnight stay. So, after a quick coffee at one of loveliest country bakeries I’ve visited in quite some time, I set off and it wasn’t long before I was surrounded by everything the BVRT has to offer. Paddocks of cows and horses, quaint farmhouses and neat rows of crops passed by before I climbed a gentle gradient where I was presented with a view of the road below snaking into the distance and the upper reaches of the Brisbane River meandering through fields and past tree lined banks. 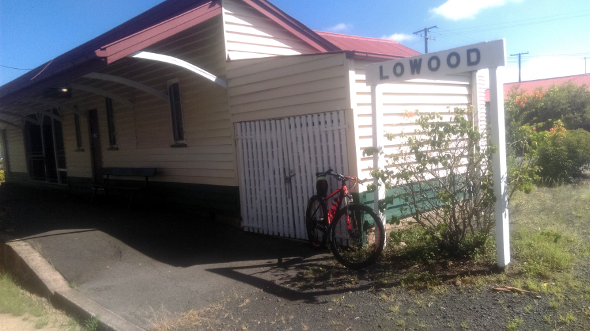 Before long, I arrived at the little town of Lowood where I came upon the first of the BVRT’s old railway stations along with the remains of the old tracks. You could almost hear the old trains rattling along the line. I tried to get one of those “look, my bike is on the railway tracks” bicycle glamour shots that you see on some boutique bike companies’ websites but I couldn’t find a stick strong enough to prop my bike up with nearby and the friggin’ thing kept falling over so I gave up. Probably just as well because a hacked production bike with a bulbous saddle bag and a pair of doufus bar ends wouldn’t have really projected the required image for such a shot anyway. 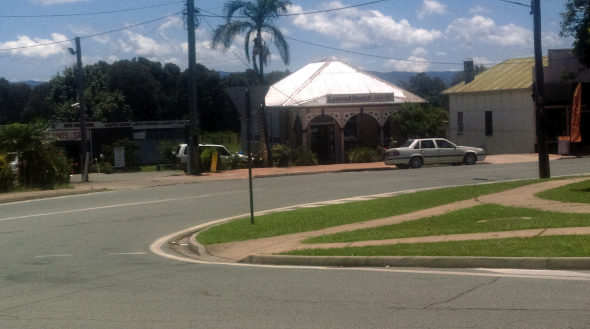 Lowood was a great little town with lots of really cool old Queenslander style buildings, a neat little park and lots of relaxed looking locals escaping the heat under shop facades and park BBQ shelters. This place had a really nice frozen in time quality that brought back a few childhood memories of growing up in Brisbane in the 80s and 90s. 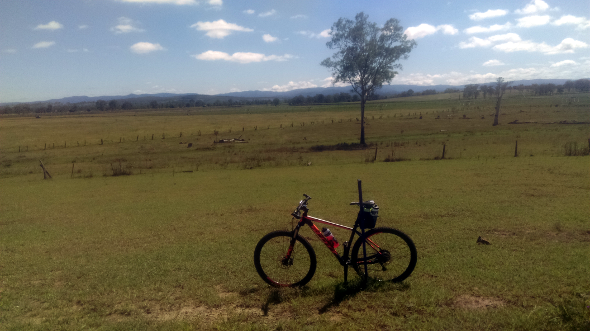 After a short stop, the BVRT lead me inconspicuously out of Lowood in between a few shops and past a golf course on one side and a field of what looked like pumpkin vines on the other. After passing though one of the BVRT’s many gates (which you are asked to close after passing through), the green and brown trail stretched off into the distance past more fields of cows and horses below shimmering heat waves against the blue sky. Although the day was hot, the breeze provided plenty of respite and maintaining a good pace was not too difficult. Though I’m sure most people will laugh at me, being the pasty city boy that I am, I was wary whenever I passed any cattle that weren’t behind a fence. There were a few bulls amongst them which I kept a particularly close eye on but in reality I think they probably see plenty of other bikes and it was just too damn hot for them to bother chasing me. A few more gates and past some fields that stretched off the side of the trail to the mountains in the distance and I came to the crossing of Lockyer Creek. This was probably the only part of the journey that truly resembled a mountain bike trail with it’s steep decent over loose, black soil down one side and corresponding climb on the other. The remains of an old railway bridge also spans the creek which is not in usable condition anymore and you are advised to keep off. 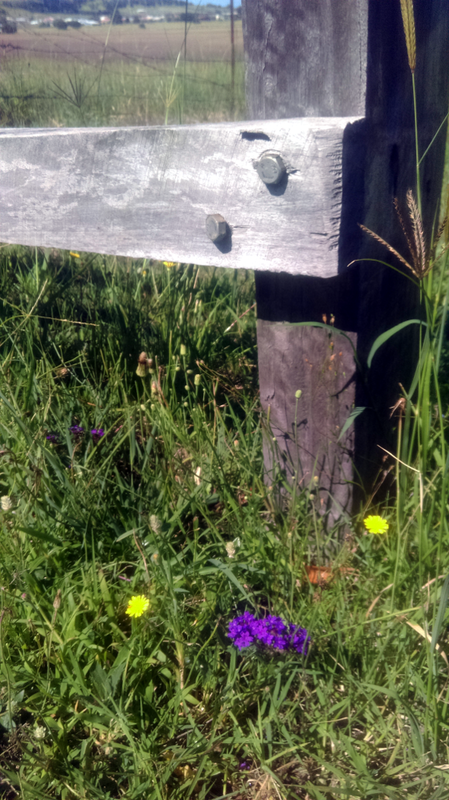 After the creek crossing, I missed the sign for the BVRT and took a little detour along a track between some fields and crossed the creek a second time a little further down before finding myself on a main road. As I headed back to where I had deviated from, cattle and goats which were escaping the heat under a large tree watched me and I could almost hear them thinking, “You idiot – you’re lost aren’t you?”. Soon I was back on track and heading for the town of Coominya. As the long, straight gravel covered trail carried me into town, a large flock of white cockatoos screeched overhead and circled a couple of times before settling again somewhere nearby by out of my sight. I was a little too slow with the camera for those guys so I headed to the general store to escape the mid morning sun for a while and for some refreshments. 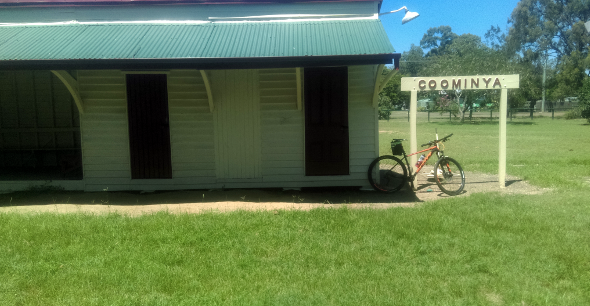 Sitting outside, I enjoyed the quietness in Coominya before grabbing my bike again and retracing my steps back to Fernvale. 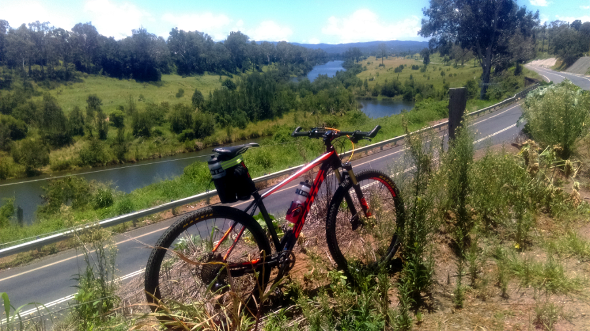 The temperature was well and truly above 30 degrees when I got back to Fernvale which made lunch and a cold drink at the local pub all the more welcoming where I sat and pondered my next adventure along the more northern parts of the BVRT. Due to time constraints, I drove to Fernvale on this occasion which is something I try to avoid whenever possible for my riding expeditions, but a similar trip could also be done completely car-free by catching the train to Wulkuraka station where the BVRT begins and heading towards Fernvale from there. Once the weather cools down a little, I’m planning to do just that and to pack some spare clothes to do a multi-day trip staying in the many accommodation choices that the towns along the way have to offer. Ride safe and see you out there some time.